Are dental amalgams safe? Is it possible to have an allergic reaction to amalgam? Is it true that dental amalgams have been banned in other countries? Is there a filling material that matches tooth colour? If my tooth doesn't hurt and my filling is still in place, why would the filling need to be replaced? Dental amalgam fillings are the most common type of filling used in Canada today. Because they are silver in color, they are used to fill back teeth. In Canada, medical devices and materials are under the regulatory authority of the Health Protection Branch (HPB) of Health Canada. Restorative materials do not fall into a classification for which Health Canada requires pre-market approval. However, Health Protection Branch can take regulatory action on any medical device or material at any time, and HPB does not restrict dental amalgam in Canada. 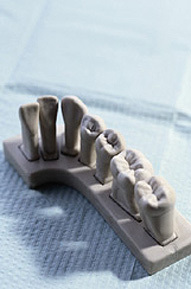 Amalgam is the most durable and affordable of all restorative material options. The Canadian Dental Association urges the government of Canada to support further research to achieve definitive scientific answers, which can better assure Canadians of the safety of amalgam as well as other alternative restorative materials. As a single element, mercury is a poisonous metal to which we are all exposed through air, water, soil and food. In dental amalgam, mercury is bound in alloy, which also includes silver, copper and tin. Very small amounts of vapour are released from amalgam with chewing. Mercury is related to the amount absorbed. No harmful effects are known to be caused by the average levels of mercury exposure from amalgam fillings. Ionomers - Glass ionomers are tooth-colored materials made of a mixture of acrylic acids and fine glass powders that are used to fill cavities, particularly those on the root surfaces of teeth. Glass ionomers can release a small amount of fluoride that helps patients who are at high risk for decay. Glass ionomers are primarily used as small fillings in areas that need not withstand heavy chewing pressure. Because they have a low resistance to fracture, glass ionomers are mostly used in small non-load bearing fillings (those between the teeth) or on the roots of teeth. Resin ionomers also are made from glass filler with acrylic acids and acrylic resin. They also are used for non-load bearing fillings (between the teeth) and they have low to moderate resistance to fracture. Ionomers experience high wear when placed on chewing surfaces. Both glass and resin ionomers mimic natural tooth color but lack the natural translucency of enamel. Both types are well tolerated by patients with only rare occurrences of allergic response. The Canadian Dental Association supports the appropriate and selective use of sealants based on caries risk assessment and diagnosis by a dentist. Sealants are an important component of a comprehensive preventive program which includes nutritional counseling, optimal fluoride exposure, good oral hygiene and regular dental examinations. Sealants work by filling in the crevasses on the chewing surfaces of the teeth. This shuts out food particles that could get caught in the teeth, causing cavities. The application is fast and comfortable and can effectively protect teeth for many years. In fact, research has shown that sealants actually stop cavities when placed on top of a slightly decayed tooth by sealing off the supply of nutrients to the bacteria that causes a cavity.